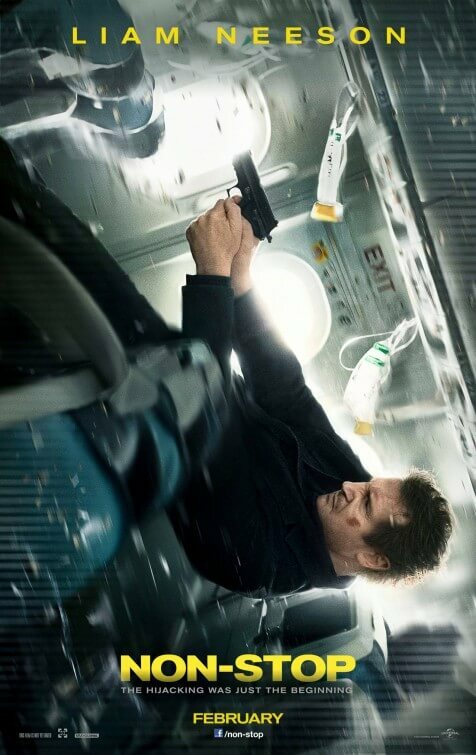 Aside from the most obvious selling point – Liam Neeson headlines yet another action-thriller – it’s likely that people would have been intrigued by Non-Stop’s contained premise. The idea of a Machiavellian killer on-board a transatlantic flight is actually rather ingenious, almost Hitchcockian in fact, and for at least half of the film it seems like it’s going to follow through with that great idea. It’s tense, it’s exciting, it’s filled with some interesting ideas; it seems like it’s going to end up somewhere completely satisfying and logical by the end, right? Unfortunately, the second half is where it nosedives (literally). Director Jaume Collet-Serra – reuniting with Neeson after previous collaboration Unknown – seems to have given in to pressure and gone all out with its latter half which is where it turns into a bombastic, out-of-place action film with nonsensical twists and turns. Given what came before in its superior first half, it is wildly misconceived and does not fit with the rest of the film’s tone. It would have worked out much better if they had kept the idea grounded – ironically, given its setting on a plane – and focused on the mystery rather than deciding to cover a bomb explosion with hand luggage 8000ft in the air. That little piece of nonsense actually does happen (though we could be wrong and it really is a way to contain a bomb explosion, in which case we’re a bunch of idiots), as does a whole other series of events that seem way too farfetched for its own good. The eventual reveal of the perpetrator is frustrating, not just because it was too obvious right from the start but because we never really knew who this person was for us to give a damn. That’s the problem with having an admittedly impressive ensemble – including Julianne Moore, Michelle Dockery, Scoot McNairy and others – and giving them nearly bugger all to do next to the headline act of Neeson (who is perfectly decent). Despite being the only other major name in the cast, Moore is completely wasted as a nervous flyer seated next to Neeson while newly-certified Oscar-winner Lupita Nyong’o only gets a few lines here and there which does not do justice for her limited appearance (though to be fair, Nyong’o filmed this WAY before 12 Years A Slave even debuted at festivals). Aside from Neeson for obvious reasons, you could have filled these roles with any other actor and it wouldn’t have made much difference. Again, the second act’s biggest fault is that it’s so removed from what came before that it takes us out of the established situation that we were more invested in. That first half presents the film’s greatest strength with a steady, not too OTT pace that’s small and brilliantly contained. It takes its time, and though it doesn’t make the best use of its starrier supporting characters it still manages to establish a tense, often engaging atmosphere. We have no idea whether the filmmakers just ran out of creative juices once they got through the half-way point of the script, but it’s astonishing how ludicrous it becomes at any point after that, just like any other action movie. Maybe this film was meant to be a straight Hitchcock thriller all the way through but someone had the idea to splice it with an action-orientated version of United 93. Either way, something didn’t go entirely right in the developmental process. Oh, and just as a quick nitpick, why is the young girl’s bear named Henry when it’s so obviously Paddington Bear? Then again, if Non-Stop can’t sort itself out then why should we expect it to answer that? Non-Stop is a half-and-half movie – the first half is a tense, interesting and provocative thriller set high above the clouds; but the second half is a dumb, out-of-nowhere action film on a plane with little satisfying payoff and acts to only undo the film’s strengths from earlier. We’ll leave it to you as to which one is the better half, but it shouldn’t come as that great a shock.